Given the length of this section, feel free to skip ahead to the specific information that you may require. 2. Mephisto, my Bosch MAXXIMUM kitchen machine. I have a tiny kitchen. My working space is limited. So is my gear and its storage space. I do believe that having the proper tools can really boost both your will to cook as well as your results, so I may have a bit more gear than others would consider sufficient. Also, if you live gluten-free, you tend to eat out less, thus justifying certain expenses. Still, I believe my kitchen gear is pretty basic for someone who does as much cooking as me. Having a small kitchen or small gear doesn’t mean you can’t be a good cook. On the contrary: I maximize space and make the most of the tools I have available. In October 2013 I partook in a baking courses graciously hosted by a woman from the largest German Facebook group on celiac disease an gluten-sensitivity. We met up, baked all day and returned home with bags of full of bread, buns and sweets. During this seminar, we ground our own flour from various grains with the host’s mill. A few weeks later, I bought my own mill, a KoMo Fidibus Medium. I bought a mill, because I was sick and tired of little packages of flour falling on me from my completely overstuffed kitchen cabinets and now only have to keep the grain at home instead of both the flour and the grain. 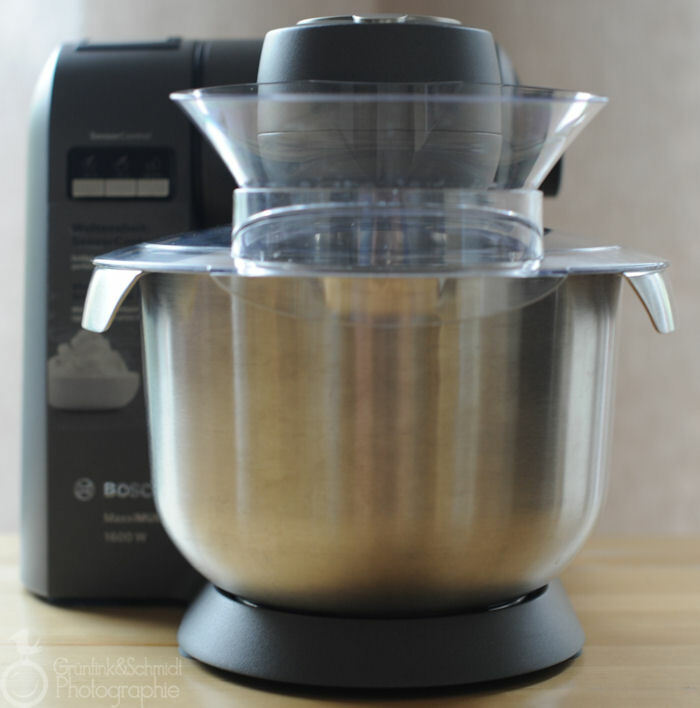 I chose this particular model, because it was on sale and because it can also grind hard grains such as corn and chickpeas aside from the softer grains such as rice, quinoa, etc. I also liked that the mill exterior is constructed under fair conditions in factories where people with disabilities are employed exclusively. 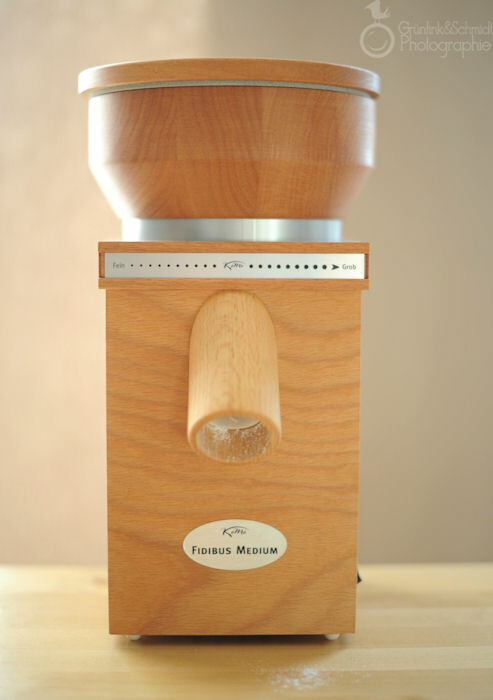 Obviously, there are “better” models that grind larger amounts of grains quicker, but for my needs this mill is perfect. I use it several times a week, e.g. for grinding sorghum, buckwheat or rice. Here is an amazon.com search on grain mills. Buying a kitchen machine was never in the cards when I still ate gluten and bought my bread all over the place. We are in Germany, after all, where you can buy amazing bread pretty much everywhere (except Cologne, they really can’t bake here!). But, after going gluten-free and kneading bread pretty much every week for about a year, I kinda got sick of it. I began searching for a helper in spring 2014 and brought Mephisto (a Bosch MAXXIMUM sadly not available in the US) home in July 2014. I did a whole huge post on him, here. Before, I only had a hand mixer, with which I could make batters of all kinds. I still own it (it’s a Siemens), it’s ten years old and only makes special appearances now, e.g. when I am trying to whip up only very small amounts of egg whites. I also have a ton of accessories for Mephisto, I can particularly recommend the vegetable shredder, the small mixing set (which can even grind flour, but I mainly use it to make nut flours and tahini) and the glass blender. I lived in Nicaragua for three years, where I learnt to love tortillas made from corn flour. 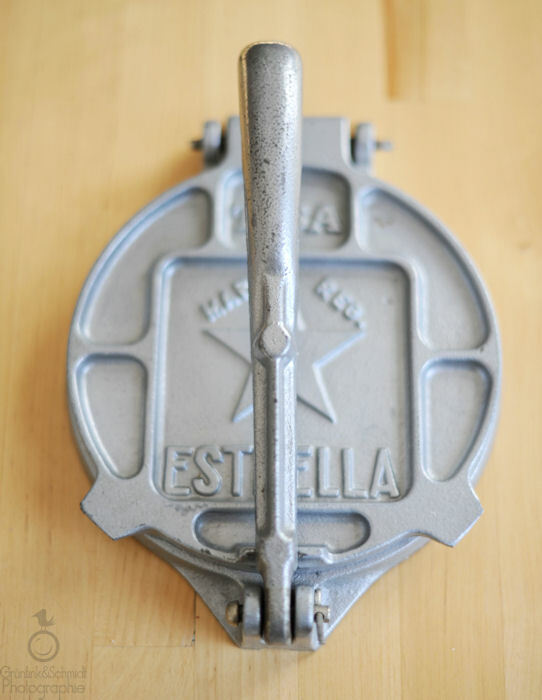 My mom bought a tortilla press for me before we moved, in the know that I would eventually put it to use in my own kitchen. You can find my recipe and tutorial for gluten-free corn tortillas here. 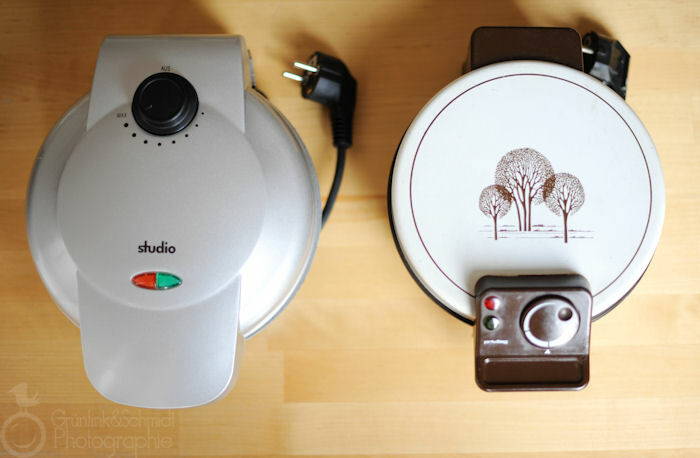 If you are in Germany, you can purchase tortilla presses online through Mex-Al (they’re located in Aachen). 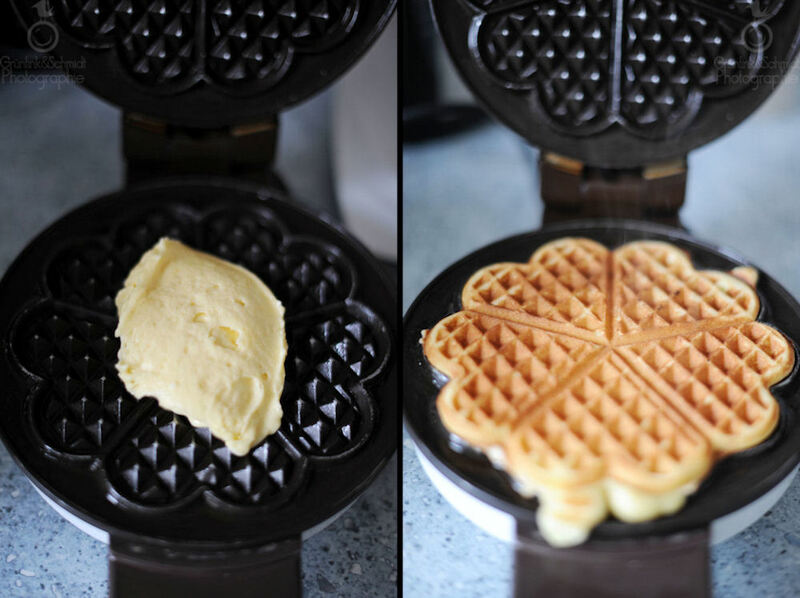 I own two waffle makers. One (on the right) was inherited to me by my grandmother. 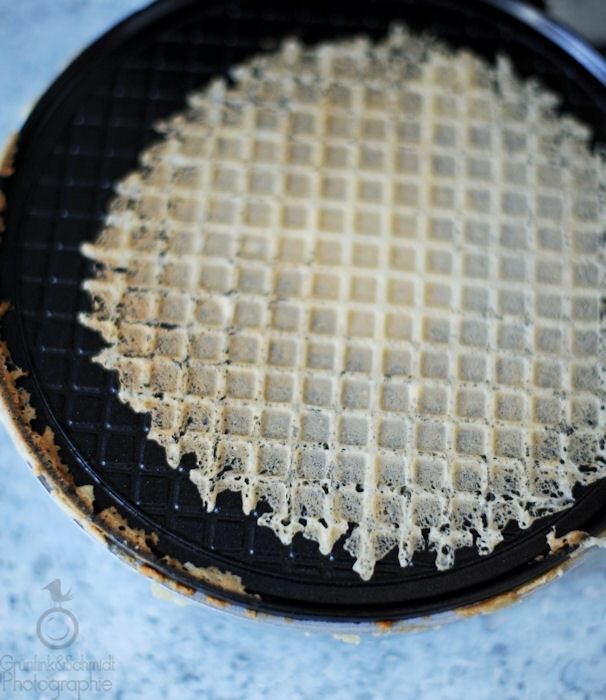 It’s to make cake-type waffles. After I went gluten-free, I scrubbed it clean and continued to use it. I kept my baking tins from pre-gluten-free times, simply scrubbing them thoroughly and baking with baking parchment on principle. I bought a small springform cake tin (for gugelhupf and pie-type cakes), as I find it’s better to make smaller cakes when you are living in a two-person household. For cakes I use springform cake tins whenever possible. Early in 2014 the bakers at the German Celiac Exchange went crazy over the mini-bun-baking-mould (the red thing on the upper left) Tchibo was selling. Don’t know Tchibo? Years and years ago they used to be a coffee chain, selling coffee – supposedly the high-end-type – to housewives and the elderly. Eventually, they ventured out into other fields of business. They now have a new range of products (there is always a central theme and the availability is limited) from their private label that hits their stores every week. 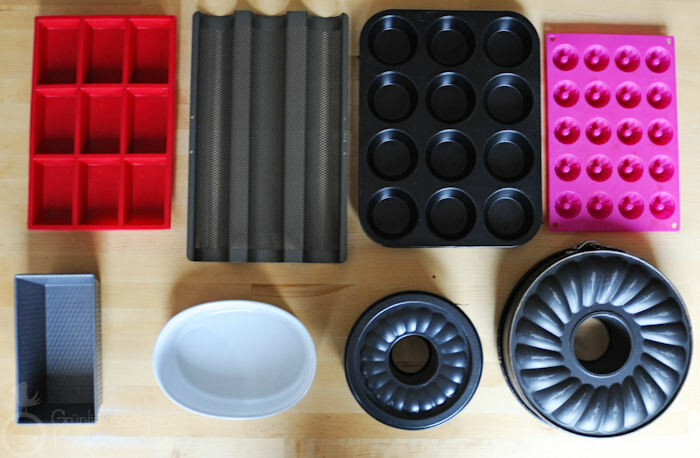 When I first saw the cake mould, I thought ‘meh’, but then the idea of baking small gluten-free mini-braids wouldn’t go away, and I now own two of these silicone-cake-forms. I also bought a cake mould for tiny guglhupf, from Tchibo (the pink thing on the far right). I also own a small and a large casserole dish (courtesy of IKEA), a baguette-tin (the strange thing next to the red mini-bun-mould), a small bread-tin and a muffin pan. I also have a Römertopf (not pictured) which I use to make dishes that you would normally place into a tajine. I also own two proofing baskets: a round one and a rectangular one (not pictured either). When we recently replaced our stove, I kept my old baking tins and am happy to now have three baking sheet that I can use for cookies, etc. I asked for the Braun Multiquick as a birthday present over ten years ago. I was given the version, which included lots of gear (a whisk, small and large containers for pureeing/shredding/ice-crushing). The blender itself gave up in 2014, so I replaced it with a new one, keeping all the accessories (which became kind of obsolete after I purchased more gear for Mephisto, my Kitchen Machine). I will always own a handheld-blender though, particularly for soups! I suggest purchasing a blender with a steel immersion section – plastic can easily melt, no matter how careful you are (it’s happened to me using someone else’s blender, just saying). This is the Multiquick Immersion Hand Held Blender section on the Braun.com website. I thought about this purchase for many years and carried it from one year’s Christmas to the next. Maybe I didn’t need a pasta maker? Realistically, how often would I be using it? Exactly! Then, I went gluten-free and still wasn’t convinced. I kept thinking about it and eventually caved, after my mother-in-law gave me some money for Christmas, that I felt would be really well invested in an Atlas Motor by Italian-manufaturer Marcato. I’m really glad I made this investment, because I actually make use of it quite frequently. If you get a pasta maker, you obviously don’t need one with a motor. But it makes things much easier and faster. At least I appreciate it! My husband tried to persuade me to get a pasta maker without a motor (they are cheaper! ), but the truth is that he’s not always home and even if he is, maybe he’s got better things to do than to wind the pasta machine before dinner? I definitely did not want to have to wind the pasta maker and hold the dough at the same time. Making pasta with this little gadget is a breeze. I no longer keep lasagna sheets in the house and make my own Ramen, Maultaschen and other delicious pasta recipes that I can’t get in a gluten-free version. I probably wouldn’t have bought this if I could just roll into any old supermarket and purchase delicious ravioli, but for a gluten-free household (or a home with multiple food allergies), this investment is definitely recommended.